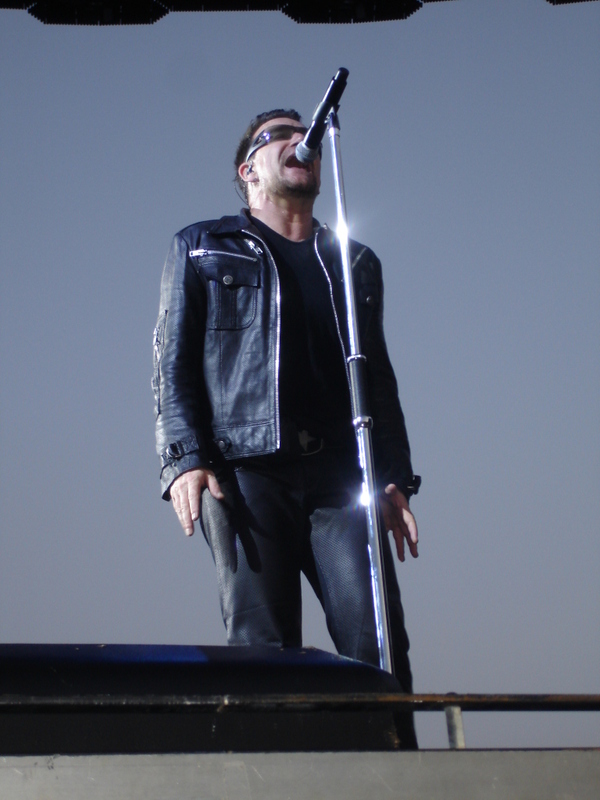 …THIS was my view of my hero, my rock god, Bono…. Oh what a night! One of the best of my life. 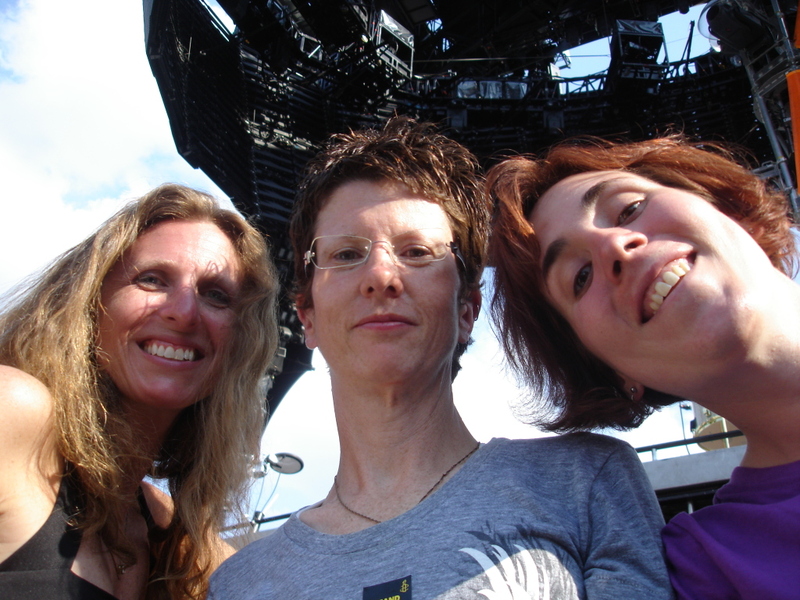 Happy anniversary, U2 360 in East Lansing, Michigan. One of my favorite concerts last summer… the best GA line, the best position in GA, the best people with whom to share it. I will never forget you, East Lansing. I’m not a person who likes to hang on to a bunch of things. So far in my life, I’ve confined my personal mementos to three huge Rubbermaid tubs. The first one contains all of the items from childhood I wished to keep. Girl Scout badges, the sash from my Junior uniform, a Heidi doll my grandma E had and my dad gave me after she died, my high school lettermen jacket (I had an academic letter, proudly earned), the National Honors Society tassel from my high school graduation, the mortar board from my college graduation, the year tassels from both my high school and college graduations. Those are only the things I can think of off-hand… I haven’t looked in there in awhile so I’m not sure what’s there. In one of my moves–before the tub–I lost the folder that contained all of my academic awards, my high school transcript, and various college report cards. I’m still mad about that loss. I ache for it sometimes because I used to call it my “brag folder” and I’d look at it whenever I felt that I was stupid (which is often). The second tub contains everything of Mike of which I couldn’t part. Again, I haven’t looked in there for awhile but off-hand, I know that it contains the polo shirt he wore the day I met him at a party called Woodchuck in the spring of 1998, a purple silk shirt he used to wear that I loved him in, his boy scout badges, a tie of the Tasmanian Devil (the Warner Brother’s cartoon creature) ripping up computers that I bought him. The guest book from his wake. Some condolence cards, the program from special appreciation service the organ donation place held months later (I donated his eyes and muscle tissue, which were the only parts that could be salvaged at his death). The third tub contains nicknacks of my first wedding. I know for sure that it contains the card box with all the opened cards within it from our wedding, my bridal bouquet (silk flowers and huge), some framed pictures that people gave us as gifts with meaningful sayings on them that we used to have hanging on our wall because we were romantic that way, a blanket with our names and wedding date embroidered on it that we used to keep on our couch, the guest book (which a lot of people did not sign because it was in a corner of the reception hall no one ventured to) and it corresponding pen. Probably the champagne glasses from our toast (they may be broken by now, I don’t know). There’s probably a few surprises in there as well. Outside of the Rubbermaid tubs, I also have several shoe boxes full of letters between me and my pen pal, Sarah, with whom I’ve corresponded since we were both 13. In a manic cleaning phase inspired by mom, I threw out the first of those letters back in high school, and I regret it to this day, because now all I have is our correspondence from college on. It would be interesting to go back and read what we wrote about our lives, hopes, and dreams when we were in middle and high school but I no longer have that. I also have other shoe boxes full of letters between me and my 10th grade English teacher–a man who feels closer to me than family at times–with whom I’ve corresponded since I’ve graduated high school. I’ve never thrown any of those letters out. I learned my lesson. I’ve kept cards people have sent me for birthdays, Christmas, and other such occasions. I have a teddy bear that my mom got from my grandma H at her baby shower. It’s old and ragged and has been sewn together many, many times, but I can’t let go of it. It comforts me when when I am sad. It has a little music box in its chest that still plays and when I am really, really upset, the music soothes me. Sometimes the music makes me melancholy too. For a past and a life I can’t remember or understand or make sense of. I have binders full of everything I’ve ever written–grade school assignments, high school papers, college papers, the various novels I wrote in high school (yes, I wrote novels), little booklets I wrote in grade school, the diaries I kept from second grade through my widowhood. Yes, I was always writing. And the narcissistic artist in me has kept everything with a religious self-importance. I do look at those occasionally for a boost, often impressed with the level of writing I had in even high school. Sometimes I wonder if my fears of rejection have caused my writing to regress. There was an uninhibited quality to my early writing that I lack now. I’m much more restrained. It’s refreshing to be able to look back and see what I was able to create at such a young age. But sad that I let go of all that potential. I still have my engagement ring and wedding band in my jewelry box. I kick myself because I lost Mike’s ring while playing soccer in Colorado. I wore it for several years because it comforted me but it was too big and slid off my finger a lot. When I lost it, I felt like I’d lost Mike a second time. I wish I’d just kept it in my jewelry box with my rings. I feel guilty for hanging onto so much stuff, though. What use is this stuff if you don’t look at it or use it at all? I have not looked in the wedding or Mike tubs in a long time because sometimes it just makes me sad to root through them. I rarely look at the tub filled with my childhood stuff, either. Yet, I think I take comfort in knowing those things are there. Still, lately, in preparing for my move to the dream house with Crow, I’ve started to consider going through those tubs and weeding out the less important items–those things that I feel less attached to. Maybe I can combine the wedding and the Mike tubs into one. Do I really need some of those things? I know, for example, that I cannot part with the polo shirt that Mike wore the day I met him. The boy scout badges, however, I may be willing to part with… And I have someone in mind to ask if he wants them… There may be other things I feel less attached to now that time has passed. And I’m impressed that I’m even considering it. Had anyone suggested I get rid of these things years ago, I would have screamed in protest. How can you make me let go of my past, I’d have cried. The thing is, I’m slowly coming to realize that the most important pieces of my past are actually always with me: my memories of the past. Barring I don’t develop some horrible mind-debilitating disease, no one can take my memories from me. When I write down my memories, as I have done in the past with diaries, I keep them even more alive. With time, memories get bent and skewed a little; writing can keep memories more true to their original form. I used to keep journals for myself mostly… with a slight narcissistic thought that someone would read them after I die and think I’m brilliant. Ha. It’s not that I feel like Crow has replaced Mike in any sense of the word. But it’s really strange–and I know a fresh widow will hate me for saying this–that part of me wants to really let go of Mike a little more. I mean, you know, Mike will always have a piece of my heart. And there’s nothing wrong or dysfunctional in acknowledging that. I still miss him sometimes. But I say without feeling any societal pressure that it somehow suddenly seems healthy to let go of some of those physical things that represent him… The amazing thing about all of this is that I came to this conclusion on my own. It’s a surprising contrast to the way I felt right after Mike died, or even five or six years ago. I’d get upset if I read other widows talking as I am now or if a family member would even suggest it. But feelings change slowly. I think the most important thing a person can do is wait until they are ready to let go. It can’t be forced or premature. I feel guilty for hanging on to too much physical stuff that I’m not using. I think that if I look through the tubs, I can find things that just don’t mean as much to me as they once did. Things I can live without. There are other things I know I can’t live without. So somewhere in the middle is a compromise. I’m ready to make that compromise. When I started looking for a house in 2005, I felt myself gravitating towards the Akron area. More specifically, the Cuyahoga Valley National Park. I had the fondest memories of my life with Mike there–we used to hike some trails, ride along the towpath, hang out in Peninsula. When Mike died, I found hiking an activity that grounded me and gave me meditative focus, a place to put all my pent up sadness, anxiety, frustration, and I would spend hours hiking various trails within the Cuyahoga Valley. My relationship with the park was both joyful and bittersweet. I was ready to face it again after I went through the whole process of leaving the area when I sold the house I shared with Mike, moved to the east side of Cleveland for a little over a year, moved to Colorado, and then returned again Ohio and the east side of Cleveland. Since Mike’s death, I have struggled with finding a place I could call home and feel like it was truly home. I think all that moving was symptomatic of my inner turmoil. I was just trying to find a place where I fit. I ended up moving back to the same town where I lived with Mike. In fact, less than a mile from the condo we shared. I felt like it was proof that I was through the roughest part of my grieving because the memories of my life in that town no longer haunted me. The ghosts had dissipated. The town had actually changed just slightly. Some restaurants we enjoyed were gone, replaced by new ones. I spent some time re-remembering the back roads to all the useful places one needs to go. And, of course, I returned to the Cuyahoga Valley. This time, as a cyclist. Cocky and full of the spirit of a Coloradoan, I was convinced that I could take any hill in Ohio on my bike because I’d spent hours climbing passes on a scant few rides in Colorado. The Cuyahoga Valley told me that I had a lot to learn. My first road was Quick and it was painful. I remember thinking, “How is it possible this hill is so hard?” I guess I never realized that while long, the roads in Colorado tend to be less steep than the windy, abrupt ascents (in some cases, “walls”) that line the Cuyahoga Valley. But I explored the Valley quite a lot those first couple summers. And along the way, I discovered this quiet little rolling road in the woods with a dozen or so houses nestled in the trees. People lived here! “This,” I thought with a smile, “would be an awesome place to live.” The same thought always came to mind as I cycled along that road on various rides with my bike club–some of them in the mysterious darkness of the late fall–for the next seven years. Fast forward to 2012. Crow and I are starting to look for houses together. Nothing formal, just looking things up on Zillow and then driving by to check them out. If they were vacant, we’d peer through windows, walk around the yard, try to imagine ourselves in those houses. We had an idea in our mind of what we were looking for and we hadn’t found it yet in our cursory, informal search. Our Tuesday night club ride has the same route every week. And every week, it goes along that road. I told Crow more than once how cool it would be to have a house on that road because I was still thinking it every time we went down it. He shared my same enthusiasm for the thought. But it was useless to wish for something impossible. So we continued looking at houses from afar. And then one Thursday night Crow and I went for an evening ride on a warmish spring evening using that very same road to get to a hill we wanted to climb. The miraculous happened–one of the houses had a For Sale sign up that had not been there when we road by with the club on Tuesday. I saw the sign but was slow to react. Crow had already stopped and was pointing. We dismounted our bikes and walked them halfway up the driveway until curiousity urged us to leave the bikes behind and walk around. The house was vacant so we looked through the windows. There appeared to be three bedrooms. Check off one requirement. Ranch style. Check for Crow who has spent several years living in the top floor of an apartment and had no desire to have to lug groceries–or anything–up stairs again, ever. Huge open living room with vaulted ceilings. Check for me. I’ve always wanted vaulted ceilings or a loft. Big windows facing the beautiful property. Check, check. A screened-in porch! Bonus points all around. We walked the yard a bit. It appeared as if the yard bordered the national park. There was wide open space in the back, a little hill behind the house, and some ravines on both sides of the property. My head began to fill with visions of snow-shoeing out the backyard in the winter. It was hard to hide our excitement. I took a picture of the For Sale sign for the agent’s phone number. Crow called the next day and we saw the house from the inside the very next day during my lunch break at work. I hate to say it, but I fell in love. I tried not to fall in love. Because, you know, there could be hidden problems with this house. And also this house’s location was definitely desireable for anyone who has a love of the outdoors and the Cuyahoga Valley National Park. It was a really nice layout on 2.9 acres of land. We learned that the house’s water is provided by a cistern–a strange concept for this city girl. Apparently, wells were are not popular in this particular area because the water is supposedly very high in iron. I soon warmed up to the idea of a cistern, though, when I realized that it is filled by collecting rain water–a commodity in Ohio–that falls into the gutters from the roof. (The water undergoes a purification process from equipment in the basement, of course.) How green is that? I’d have to get used to a septic tank. Totally typical for just about all of the places Crow and I desired to live. Heating oil for the furnace and hot water tank. Again, pretty typical (though some use propane, and we agreed we could later switch if we wanted). The only “city” utility provided is electricity. So very rustic. For me. Crow, who spent some of his teen years on a farm with the same conveniences, was completely calm about all this. Which helped. Small sacrifices, I think, for the location. One of the rationalizations I used to get past my unsure feelings about such a setup was that all the other houses on the same street had similar situations. From all appearances, those houses were in good shape and lived in. I also got the sense from the realtor that the seller–a trustee to the estate of the original owner–had a love for the house. The interior of the house itself is in decent shape. There are full bathrooms–one full bathroom in the master bedroom, check!–that are in desperate need of some TLC and updating. A full basement with an extra room for storage or a work room. Wood floors in the living room and hallway. All three bedrooms have old carpet in desperate need of replacement. It definitely was going to require some fixing up. But even with all those imperfections, I could see what the house was and what Crow and I could eventually make it into. We spent the weekend doing everything we could to get our ducks in a row so that we could put an offer in on the house–getting loan pre-approval, signing a real estate agent, and, believe it or not, evening visiting a few open houses in the area. We put a bid on the house the following Tuesday. Our offer was accepted after going back and forth the obligatory few times. We got it at a very reasonable price given all the updates the house would most definitely need. We went through the whole long and drawn out process of inspections, appraisals, and waiting on the loan to go through. It was a long month. We missed our original closing date by over a week. We were on needles and pins for weeks, saying nothing to our friends or family about the house out of a shared paranoia that something would go heartbreakingly wrong. But finally, that day came. We signed all the papers. We got the keys on Monday. We’ll be spending the next week preparing the house for us to move in (painting, wiring, cleaning) and then packing the stuff at our own places. We’ll move in June 23-24th. Our dream house is no longer a dream.